is designed, edited, and created by Michael Annis, senior editor and founder of Howling Dog Press. The Featured Artist for OMEGA 7 is Henry Avignon. OMEGA 7 is comprised of dynamic and visionary work by 45 writers whose poetry, stories and Hinge applications cover progressive politics, global warming, governmental corruption, revolutionary language theory / linguistics, anti-war works, social and economic stratification, human alienation, imprisonment, abstracted reality, dreams and the subconscious, quantum mechanics, poverty, and pieces dedicated to world unity and peace. A special section by the late CharlesBukowski is central to OMEGA 7. Other literary contributors are Michael Annis, Henry Avignon, Benjamin Balthaser, Tom Bradley, Ginnetta Correli, Jane Crown, Nabina Das, Tatjana Debeljacki, Jared Demick, DubbleX, Renee Dwyer, Stevie Lee Edwards, AnnMarie Eldon, Victoria Ganim, Joe Giglio, Gregory Greyhawk, Leigh Herrick, Sandra Hunter, Molly Kat, Jillian Rose Krupp, Sun Yung Lee, Joy Leftow, Heller Levinson, Oswald Le Winter, Elenor “Ele-Beth” Little, Adrian C. Louis, Michael D. Main, Stacy Muszynski, Edward Mycue, Mary Newell, Valery Oisteanu, John Olson, Laura Orem, David Ray, Paul Corman-Roberts, Kenneth Rosen, Adam Roufberg, Albert Salinas, Lilvia Soto, Thomas [Wordwulf] Sterner, Ross Vassilev, Jack Wiler, Frank Winters, and Jeffrey Cyphers Wright. “I just saw the preview of Michael Annis’/ Howling Dog Press’ new Omega 7 online journal publication “From Hive This Mind” featuring a slew of amazing poets including Michael Annis, David Ray, Heller Levinson, Leigh Herrick, Oswald LeWinter, Paul Corman-Roberts, and others (not to mention myself…) and I have to say that this man (Michael Annis) is a creative/intellectual genius – a truly divine spark. “From Hive This Mind” is a labor of love blending together a most magnificent compilation of poetry, photography, spirit, and graphic design capable of being produced only by a true visionary — one who sees through, and beyond, the corporeal constraints imposed on us physically, culturally, emotionally, etc .And, as an added bonus, this masterful work is published online for FREE. “Stay focused for soon the publication will go public and a link will be posted (but join the group instead so you don’t have to rely on me for your information) Join “Omega Online Literary Magazine” on Facebook. OMEGA 7’s theme is derived from an excerpt from Conducting Bodies by Nobel Prize winner Claude Simon. OMEGA 7’s subtitle “from hive this mind” is taken from a Hinge Application of the same title composed by Michael Annis and “hinges” back to Claude Simon. Hinge Theory was created by Heller Levinson, and is evolving through the work of Levinson, Annis, Newell, Giglio, Main, Avignon, Roufberg, and others; Hinge represents, quite possibly, the most significant revolutionary poetic form to have been originated in the last 20years, and can be explored further in Levinson’s latest book “Smelling Mary” (Howling Dog Press). A practioner’s guide to Hinge Theory, “The Hinge Manual” by Michael Annis, can be received free of charge in PDF format by request to WritingDangerouslyATHowlingDogPressDOTcom. you will find when you open OMEGA 7. 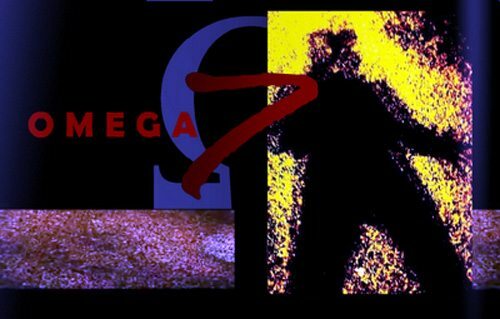 Also, OMEGA 7 includes a very special offer: The Works of HENRY AVIGNON, OMEGA 7’S ARTIST are NOW AVAILABLE for purchase! SUPERB, LIMITED EDITION PRINTS of all the artwork by HENRY AVIGNON featured in OMEGA 7 are now available through a joint collaboration between the ARTIST and HOWLING DOG PRESS. Details: page 247 in OMEGA 7. This entry was posted in Michael Annis and tagged Adam Roufberg, Adrian C. Louis, Albert Salinas, AnnMarie Eldon, Benjamin Balthaser, Charles Bukowski, Claude Simon, David Ray, DubbleX, Edward Mycue, Elenor “Ele-Beth” Little, Frank Winters, Ginnetta Correli, Gregory Greyhawk, Heller Levinson, Henry Avignon, Howling Dog Press, Jack Wiler, Jane Crown, Jared Demick, Jeffrey Cyphers Wright, Jillian Rose Krupp, Joe Giglio, John Olson, Joy Leftow, Kenneth Rosen, Laura Orem, Leigh Herrick, Lilvia Soto, Mary Newell, Michael Annis, Michael D. Main, Molly Kat, Nabina Das, Omega 7, Oswald Le Winter, Paul Corman-Roberts, Radio Active Lunch, Renee Dwyer, Ross Vassilev, Sandra Hunter, Stacy Muszynski, Stevie Lee Edwards, Sun Yung Lee, Tatjana Debeljacki, Thomas [Wordwulf] Sterner, Tom Bradley, Valery Oisteanu, Victoria Ganim by Monsieur K.. Bookmark the permalink.